Many older homes and structures in the United States were built with solid wood soffits and fascias. These solid wood surfaces, especially when they are freshly painted, provide great accents to the roof line of the home. However, the presence of solid wood surfaces can inhibit the movement of air in the attic space of the home. Ventilated soffits can provide sources of cross ventilation for attic spaces and enhance the performance of passive ventilation systems such as ridge vent. Installing ventilated soffit vents into the solid wood soffits on your home or building is a simple process. It can be accomplished using a variety of products and techniques. The goal behind installing the soffit vents is the same regardless of the technique and product that you choose. The goal is to provide a source of cross ventilation to allow fresh air in through the soffit vents and allow the stale hot air to ventilate out through the passive vents on the roof such as ridge vent. Installation of soffit vents requires several specialized tools and equipment in order to complete the installation correctly and safely. Keep in mind that while working on the soffit area of your home that you are working on a surface that is directly overhead. As a result, you will be looking up as you are working which will expose your eyes to falling debris and dirt. It is highly recommended that you wear safety glasses or safety goggles to protect your eyes while you are working on overhead surfaces. Before you begin to cut into your solid wood soffits, it is recommended that you do an interior inspection of your home in the attic space. When you inspect the interior of the attic, you are looking to identify the gap between the underside of the roof deck and the top of the framing for the outside bearing wall of the home. This gap must be open to allow air to move freely from the soffit vents into the attic space. If the framing is tight to the underside of the roof deck, the installation of soffit vents may not be applicable to your home. If the gap between the underside of the deck and the top of the bearing wall is open but filled with insulation you will need to open the gap up by removing the insulation. There are Styrofoam baffles that are available to install in these gaps which provide an air space for the free flow of the air while allowing insulation to remain in place. After determining the ability for air to move freely from the soffit into the attic space, you will measure the interior dimension of the soffit. This will allow you to determine where to drill the holes in the underside of the soffit. Measure the dimension from the exterior edge of the soffit back to the first framing member. You want to make sure that your holes that you will drill will only go through the solid wood soffit panels and not into framing members. These dimensions will be transferred to the underside of the soffit panels in step two. On the exterior of the home, use the chalk line to mark lines in the soffit area to guide where you will place the holes. You will utilize the measurements gathered through the interior inspection of the home and apply them to the underside of the soffit. The chalk line mark will represent the limit of where you will drill the holes into the soffit panels. After applying the chalk line, use the cordless drill and the paddle bit to drill holes into the soffit. It is recommended that the holes in the wood soffit be drilled at a rate that will allow sufficient air flow to match the flow of passive vents in the attic. For example, when using a 1.25” paddle drill bit it is recommended that up to ten holes be drilled into the soffit area for each linear foot of soffit area. Now that the holes have been drilled into the soffit area, the next step will be to install the soffit panels over the surface to conceal the holes drilled into the solid wood soffits. You begin by installing the j-channel around the leading edge of the soffit area that you are working on. The j-channel will be positioned against the exterior of the home’s bearing wall and the longer flange of j-channel will be positioned against the underside of the soffit panels. Apply zip screws through the flange of the j-channel into the solid wood surface to secure the j-channel into place. The j-channel may be cut with the tin snips at all angle changes to allow it to fit. 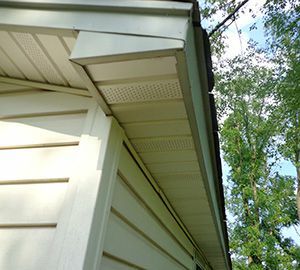 If you are applying the new soffit panels without capping or concealing your fascia boards with aluminum, you will need to apply the j-channel to the exterior edge of the soffit area as well. All leading edges of the new soffit panels must be secured and concealed in order to complete the installation. Once the j-channel has been installed, measure the distance from the interior of the j-channel along the bearing wall of the home and the exterior edge of the soffit. If you are using an additional course of j-channel to finish the leading edge of the soffit panels you will need to allow for room in your measurements to be able to maneuver the soffit panels into place. Remember as well that soffit panels will be cut and installed perpendicular from the bearing wall of the home and not parallel to the surface. Once the panels have been cut to length, maneuver the soffit panel into place by sliding it into the j-channel and positioning it so that both leading edges of the panel are nested into the j-channel groove. Attach each panel with zip screws through the slotted flange of the soffit panel. Position each subsequent panel onto the soffit area and interlock the panels together. Apply fasteners as needed to secure the panel tightly to the solid wood soffit. Soffits on homes are often used to provide locations for outdoor lighting, speakers, and other accessories. It may be necessary to remove and resecure these items as you are completing your installation. If you encounter these types of obstructions while completing your project it is recommended that you hire a professional electrician to move these items out of your way while the installation is taking place and then have them resecure these items after your project is completed.